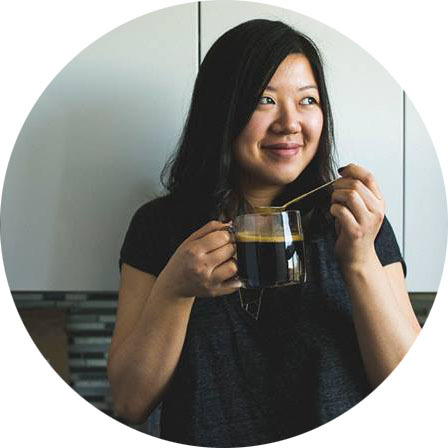 Annie Chu is the writer and photographer behind Chu on This®, a culinary travel publication highlighting things done well, near and far. When she’s not cooking or eating, Annie also acts as lawyer to clients in the food industry. I’m not Korean and I don’t have a Korean mother. However, for all intents and purposes, my mother basically has a Korean kitchen. We always have a large jar of kimchee in the fridge (sometimes homemade, sometimes not) and just about every Korean spice known to our grocery store available and ready to go for a pork bone stew or spontaneous Korean-style BBQ. There’s something about the comfort of Korean food that really speaks to us as a family, and even though I have only been to Korea once as a young child, eating Korean food always gives me that nostalgic feeling of being home. Pork belly is seriously such a hot ingredient right now, and I’m glad, because it’s delicious. Thankfully, we are pretty lucky in Ontario to have access to really good quality pork raised with very high animal welfare standards. Almost all of Ontario pork farms are family-owned and operated, and the pigs raised here are fed really well (check out these videos for more information). All the better for producing great pork belly! 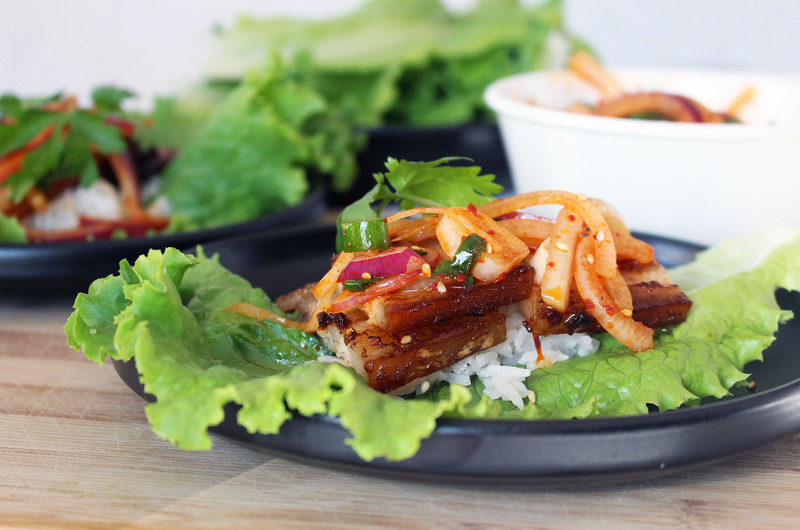 The best way to make Korean pork belly is with a Korean grill (and a Korean mom!) but falling short of that, you should do it this way. Trust me, you’re going to want to make this again and again. Notes on authenticity: I have added cilantro for garnish because I think it tastes great with the dish and adds that extra pop of colour. However, 90% of Koreans do not like the taste of cilantro because it does not naturally grow in Korea and your Korean friends probably won’t like it either. 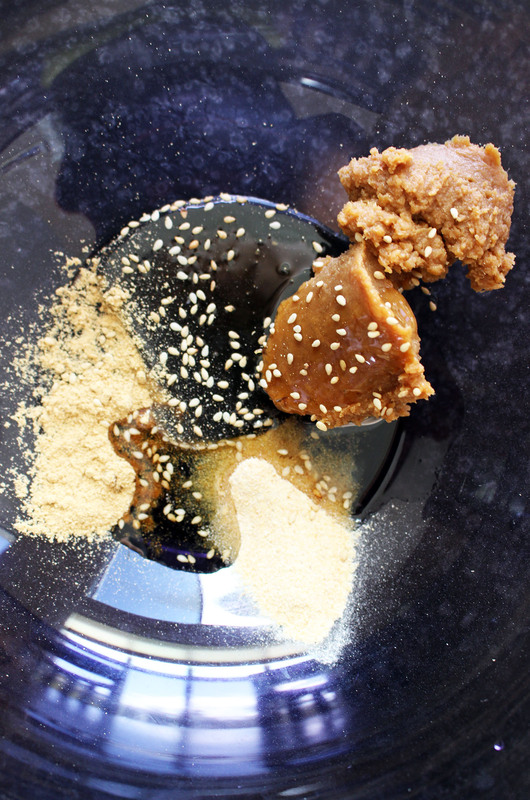 Though not necessary, you may also want to add some ssamjang and raw garlic for a bit of an extra flavour boost. 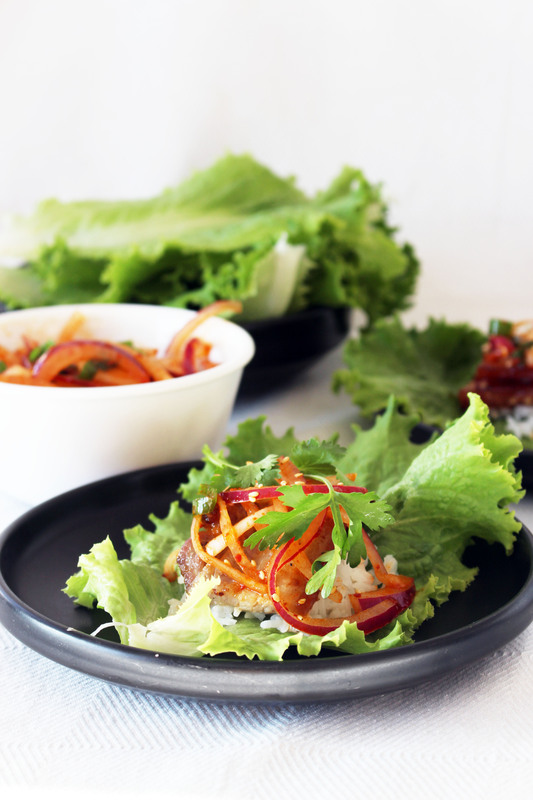 For serving: leaf lettuce, cooked white rice, cilantro. Preheat the oven to 400 ºF. the pork belly. Rub in well, and let the strips rest in the bowl for about 10 minutes. If you are preparing ahead of time, you can leave it covered for few hours in the fridge. Spray a grilling or baking rack with oil and place over your foil-lined baking pan. 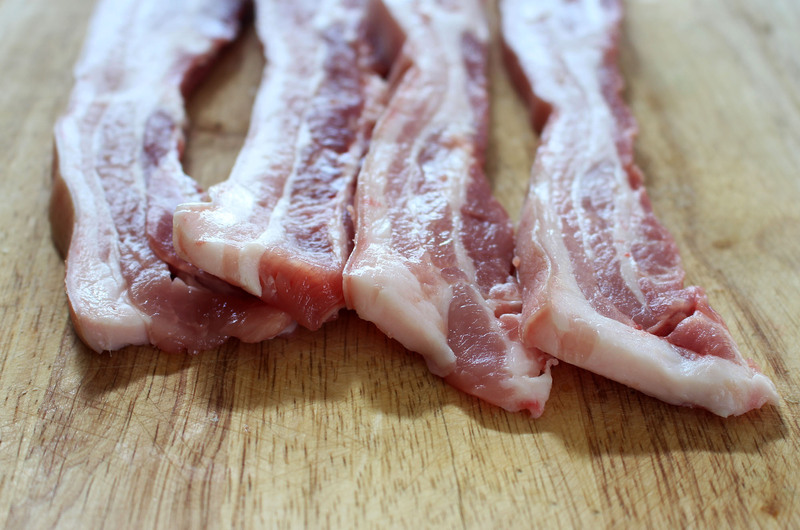 Place the strips of pork belly on the rack and space evenly. Bake for about 15 minutes at 400 ºF and flip the slabs over so that they cook evenly. Turn down the oven to 350ºF and continue baking for about 20 minutes. These times are just estimates, and a meat thermometer should read about 165ºF. I usually just go with the sound of the sizzle and look for that caramelized brown colour as a judge of “doneness”. Let the pork rest on the counter for a few minutes before slicing. Serve with lettuce, rice, onion salad and cilantro. Slice each of the onions in half and then lengthwise into thin strips. 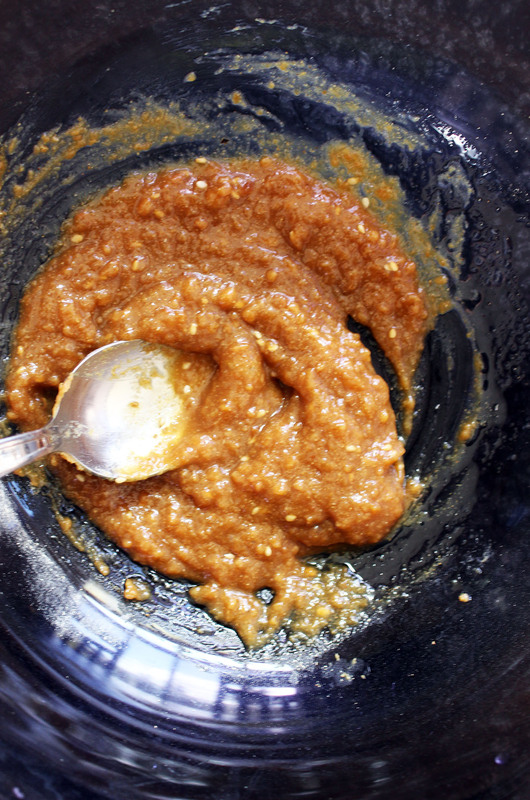 Loosen the strips with your fingers and toss into a medium sized bowl. Cover the onions with cold water for about 15 minutes. This step is very important as it keeps the onions crisp and removes some of the sting. In another bowl, combine chili flakes, sugar, soy sauce, apple cider vinegar, sesame oil, sesame seeds, and chopped green onion and toss the onions with the dressing. Cover and let sit in the fridge for 10 minutes before serving. 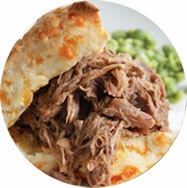 For even more meal ideas browse our extensive library of delicious and nutritious pork recipes. Pork and mushroom pierogies…and the lady from Berlin.